It’s been a lovely party, you’ve eaten a tip-top desert, and drunk an excellent bottle of wine. But once dishes go into the sink, and the door closes on your friends and family, it’s hard to capture that sensation of ease and happiness again. Here’s a quick remedy. 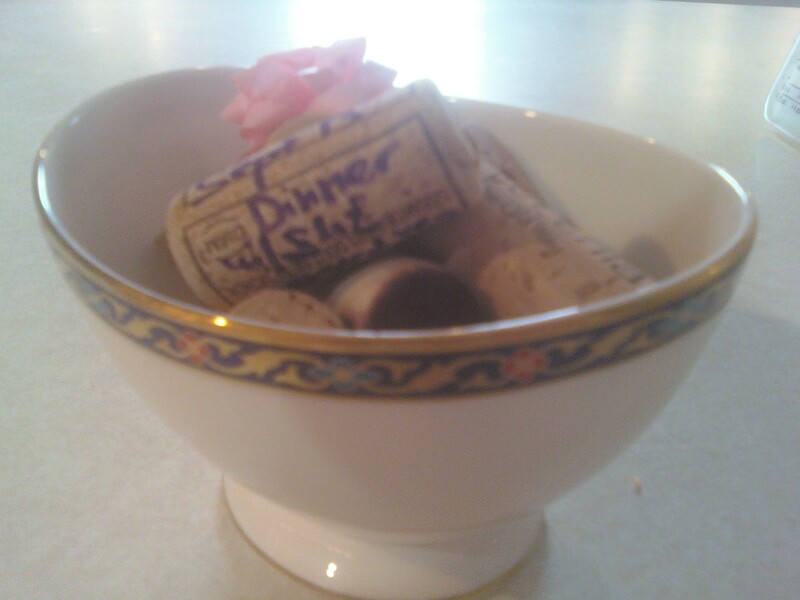 Take the cork from the wine bottle, write the occasion and the date with a marker, and put the cork in a pretty bowl. Over the year, your bowl will fill with happy memories. On rainy days, you can trawl through the bowl re-living good times. If you want to get fancy, write a little note about what you ate, your favorite stories, or what you loved best about your friends and family members. Snap it on with a rubber band, or a little bit of ribbon. Happy Memories! May the year bring you sweetness in all its tender forms. A great way to savor the moment and retain full benefit of our happy moments. Thanks, Cynthia!